Domenica Amato produces distinctive wines inspired by the grape growing regions on the coasts and islands of the Mediterranean Sea. Sourced from small, family-owned vineyards, and hand-made with passion and authenticity using old-world methods, these wines are available in extremely limited quantities and are best enjoyed with your loved ones around the Sunday dinner table. Each wine is produced in extremely small quantities, and our offerings may change from year to year based on the discovery of an exciting new vineyard source or the desire to experiment with different varieties, styles or blends. Our winery sits adjacent to an estate vineyard in Dry Creek Valley known as the Vinegrove, which features several different blocks with unique exposures and soil types. The “swale” in the center was planted mainly to Syrah when we arrived here, with different sections exposed to varying degrees of sun exposure and water drainage, allowing for added complexity in the winery if harvested and vinified separately. Isolated up in the hills, it is a few degrees cooler than the valley floor, providing just enough balance to the generally rich and ripe Syrah grown here. We have since budded over the Syrah to Grenache and Petite Sirah, which we look forward to producing wines from in the coming years. The confluence of three overlapping AVAs at Ceja Farms – Sonoma Coast, Carneros and Sonoma Valley – produces a unique environment that benefits our Grenache Blanc in myriad ways. The ocean breezes through the Petaluma Gap combine with the fog rolling off the northern reaches of the bay to provide a consistently cool climate and long hang time, perfect to retain acidity necessary for a crisp white wine. Unusual for the region, the soil in this block is deep, dark and rich, with volcanic material combining with clay to produce vibrant, expressive flavors. 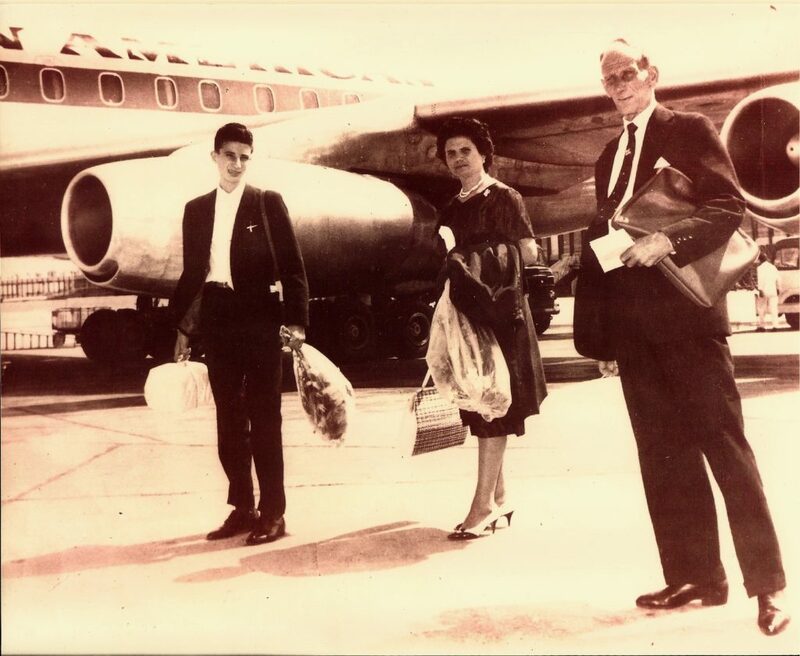 Pioneers in the region, the Bacigalupi family played a key role in putting the California wine industry on the map, selling Chardonnay to Chateau Montelena for the wine that triumphed over top-flight white Burgundy at the 1976 Judgment of Paris tasting. The site benefits from cool air and fog channeled in from the Pacific, as well as the famously unique Goldridge loam soil – eroded volcanic material combined with sandstone and alluvial deposits. Joe Vivio’s meticulously farmed vineyard is located in the secluded Bennett Valley, a cool climate region that lies in the path of the coastal fog and ocean breezes as they meander inland from the Petaluma wind gap. Planted on the side of Mount Taylor at approximately 800 feet above sea level, this is a low-vigor site with an extremely long growing season, and reddish clay loam and fractured volcanic rock soils ideal for growing Rhône varieties. Stuller Vineyard grows amid redwoods at 1200 feet of elevation on a coastal ridge with views to the Pacific Ocean just 6 miles to the west. The vineyard has tremendous soil diversity, and is planted to two different clones of Pinot Noir – Dijon 115 on the steep hillside of clay loam, and Dijon 667 on the gravelly hilltop. The ocean breeze, cool climate and porous soils keep yield naturally low at a mere one-ton per acre on average. 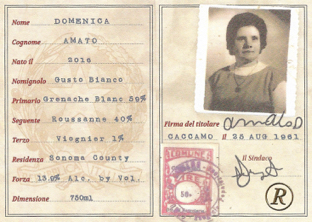 Domenica Amato is named for winemaker Michael Scorsone’s grandmother who was born in Sicily and emigrated to America along with Michael’s father and grandfather in the 1960s. 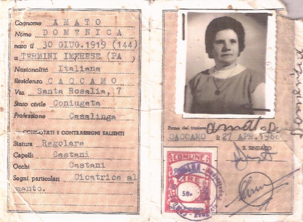 Our label is based on the passport that Domenica had with her when they arrived in the USA on August 25, 1961.